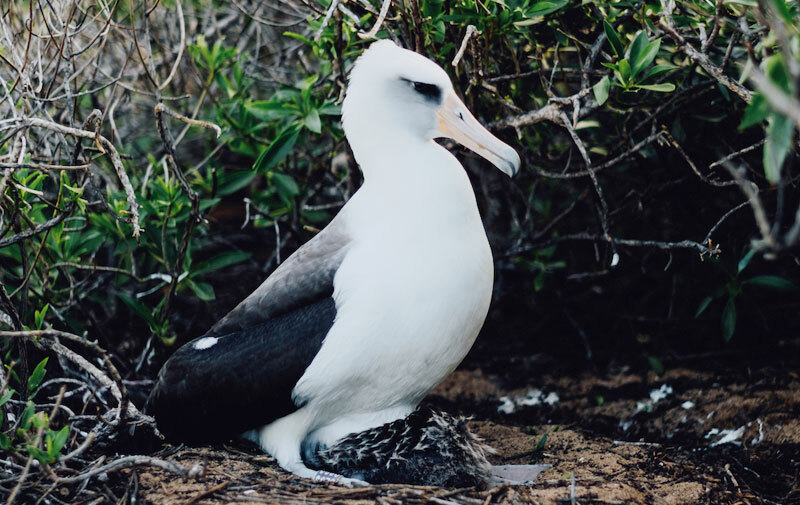 In spite of setbacks throughout the past century, island albatross colonies, including the rookery at Ka‘ena Point, are growing once again. Whether you walk it from Keawa‘ula Beach on O‘ahu’s west side or Mokulē‘ia on the North Shore, the shadeless path to Ka‘ena Point Natural Area Reserve is likely to feel long and hot. 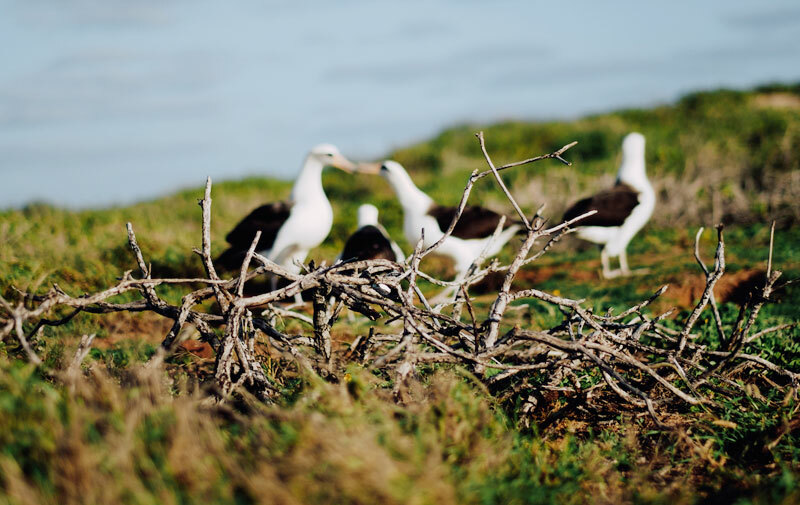 Ka‘ena, after all, means “the heat.” But you have to go all the way to the end and through the protective fencing if you want to see the area’s preeminent drawcard—the mōlī, or Laysan albatrosses, that nest there. Standing knee-high, the native, snow-white birds with ashy wings are known for their elaborate courtship dances, in which they repeatedly bob, bow, click their beaks, and jab them skyward, squawking with shrill vibratos. All mōlī that start their lives at Ka‘ena—one of the species’ 16 known breeding colonies in the world—reliably return here from the furthest reaches of the North Pacific each November to dance, breed, and lay a single egg that will hatch in February and, should the chick survive, fledge by July. So if you get tired along the hike, if your legs ache and you feel parched, consider the fact that the average mōlī has traveled at least a thousand miles to reach this protected place. Some of the adolescent birds setting their webbed feet down on Ka‘ena’s sandy soil may have been away from dry land, having rested only at sea, for up to five years. As a species, mōlī have figuratively come even further to cross paths with you. Listed as “near threatened” by the International Union for Conservation of Nature, Phoebastria immutabilis only recently ascended from a century of devastating turbulence bookended by two remarkably similar atrocities, both of which became international causes célèbres. The first tragedy befell the birds at the start of the 20th century. In late 1909, the American cutter Thetis was sent to the Northwestern Hawaiian Islands to enforce President Roosevelt’s new executive order protecting the area’s indigenous birds. 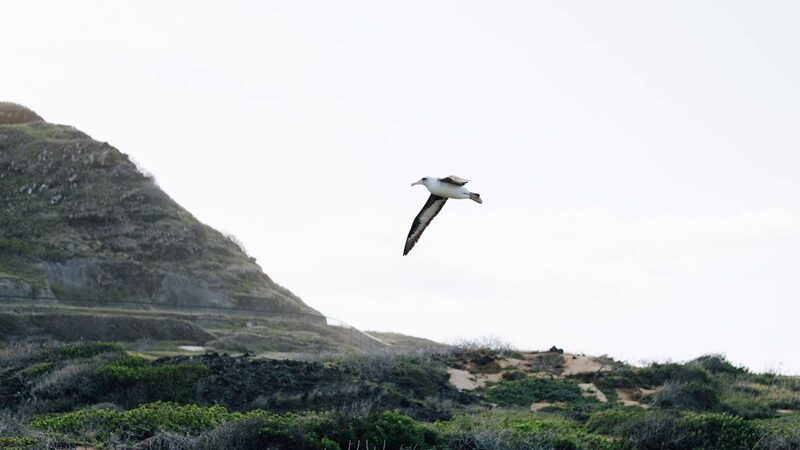 Their target was Kauō, or Laysan Island, the 2-square-mile home of many native species and a mining operation established in the 1890s to source fertilizer ingredients from seabirds’ solidified manure, or guano. 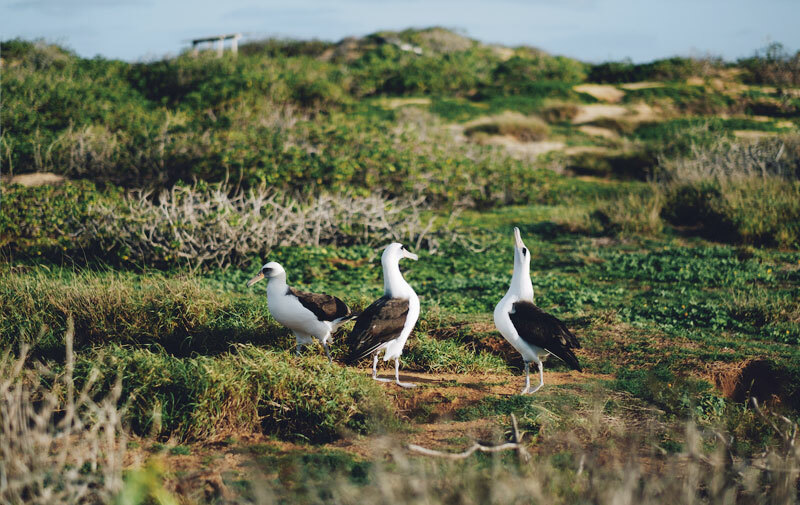 Upon arrival at Kauō, the crew discovered a group of Japanese workers using the island’s few wooden buildings not for guano processing, but for the packaging of albatross feathers destined for international millinery markets. The island was peppered with the spoils of the poachers’ harvest—thousands of piles of albatross carcasses, the breasts of which had been plucked clean. In most cases, the birds’ wings had been cut off, too. Thetis’ crew rounded up 15 of the poachers on Kauō and eight on nearby Papa‘āpoho and brought them to Honolulu. They also brought evidence, reported by one newspaper to be 259,000 bird skins and wings, two and a half tons of baled feathers, and several large cases and boxes of stuffed birds. A follow-up biological survey conducted by the U.S. Department of Agriculture in 1911 counted 180,000 mōlī on Kauō, and estimated that the poachers had killed at least 200,000 in less than one year. 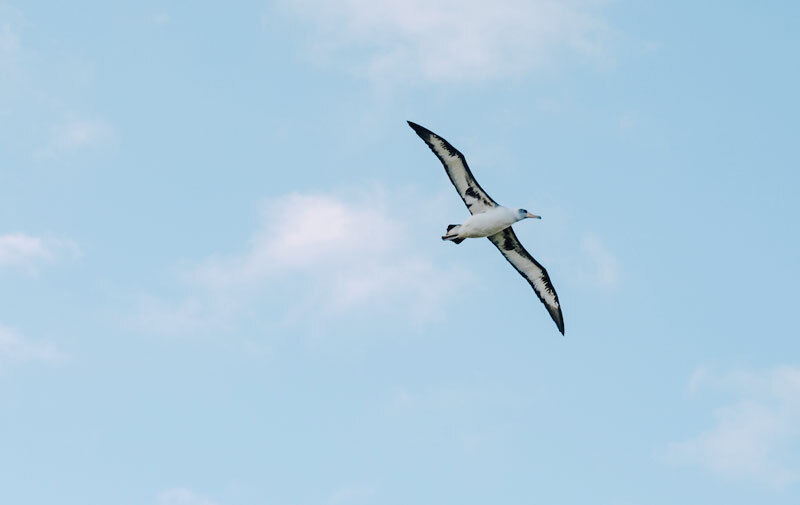 Laysan Island is the English namesake of the Laysan albatross, but its current colony of about 150,000 breeding pairs is actually second in size to the rookery at Midway Atoll, which boasts more than 500,000 pairs. By contrast, Ka‘ena Point’s colony, with about 100 nests, is tiny. Because it is so small, the senseless loss of 15 adults and 17 eggs to a savage teenage romp in 2015 sent an acute and sustained sting through island communities. Following the arrest of three local high school students, waves of residents blared their outrage, while—just as in 1910—the news media had a field day. Two of the offenders were minors, tried privately in family court, while the one 18-year-old perpetrator was handed a 45-day prison sentence, a $1,000 fine, and 200 hours of community service. In December 2017, exactly two years after the Ka‘ena incident, conservationists relocated 21 eggs from a Kaua‘i military training area to Ka‘ena Point. Arriving amid the Makahiki season that celebrates the god Lono, the eggs carried a healing symbolism for Hawaiians who view mōlī as Lono’s kino lau, or physical manifestation. At the end of the season, many a breeding pair hatched ashy brown puffballs, that by late summer, will fledge into white-breasted giants with characteristic streaks of gray around their large eyes. If you can, try to make the hike in time. You just might see one spread its freshly feathered wings to a full six feet, catch the warm breeze, and ride the heat beyond the blue horizon. The Mākeke Market, a farmers market on the West Side, supplies the community with a healthier and happier diet. “How can we be a food desert and be a food basket at the same time?” asks Alicia Higa.